Audi has announced a new plus Coupe addition to the 2013 R8 V10 range with more performance and new transmission and features to the whole R8 range. When an automaker is the leader in performance, they can’t stand still and Audi is moving forward by updating the whole R8 high-performance model range for 2013. Audi has announced an all-new 2013 R8 V10 plus model and the addition of a new S tronic transmission that makes its debut in the model range. The Audi R8 has always been the brands top spearhead model, and now it gets even better with more power, a new transmission and updates to the lights and the use of new lightweight materials to reduce weight. 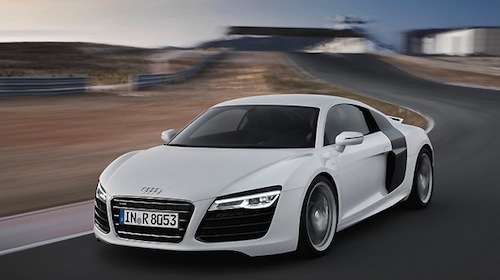 The 2013 Audi R8 comes in Coupe and Spyder body styles and will be offered with three engines. The standard V8 delivers 430 horsepower and 317 lb-ft of torque, and with the new S tronic the Coupe sprints from 0-62 in 4.3 seconds with a top speed of 186 mph. The Audi R8 V10 produces 525 hp and 390 lb-ft of torque and goes from 0-62 in 3.6 seconds and has a top speed of 195 mph. The R8 will still come with the six-speed manual, but an all-new seven-speed S tronic replaces the R tronic used previously, and will come standard on all V10 models. The new S tronic features a dual-clutch with a launch control function that provides optimal traction when starting. Power is delivered to all four wheels via the quattro permanent all-wheel drive system with a rear-axle bias. At the top of the model range, Audi is introducing the new R8 V10 plus Coupe with 550 hp and 398 lb-ft of torque. When equipped with the S tronic, it accelerates from 0-62 mph in just 3.5 seconds and has a top speed of 197 mph. Audi is only offering the new top V10 plus model as a Coupe. The increase in power is due to modified engine management and the S tronic will fly past the 124 mph mark in 7.8 seconds. With the six-speed manual, the R8 V10 plus sprints from 0-62 in 3.8 seconds. The all-new S tronic delivers superior performance and also gets improved fuel mileage of 18 mpg versus 16 mpg for the standard transmission. Audi has reduced the weight of the new top model R8 V10 plus by 110 pounds. Engineers were able to use an aluminum Audi Space Frame that weighs just 463 pounds which is roughly 40 percent less than a comparable steel structure. The body of the new R8 Spyder with its electrohydraulically actuated cloth top weighs just 476 pounds. On the outside, the new R8 range gets all-LED headlights and rear tail lights are now standard on all models. The 2013 R8 also features a new Singleframe grille with tapered corners at the top, a redesigned diffuser and large round tailpipes. The R8 V10 plus features a new diffuser that is made of special carbon fiber reinforced polymer. A new material made of carbon fiber-reinforced polymer (CFRP) is found in the interior of the new top range R8 V10 plus. The new bucket seats feature folding backrests and comes with a honeycomb-quilted Fine Nappa full-leather package. The all-new 2013 Audi R8 models get new updates, and the range-topping V10 plus adds even more performance. The supercars will be built in the quattro GmgH factory in Neckarsulm and will be launched first in Germany at the end of this year. The new performance models will launch in the U.S. sometime in early 2013.